Grayguns Precision Adjustable Straight Trigger features a flat trigger face that provides excellent control and a positive sear break. Completely adjustable for pre-travel take-up and over travel. Manufactured from 7075 aluminum and finished with hard coat anodizing and comes in various colors. This trigger is gold. Designed to fit both current and older model traditional double action (DA/SA) including: X5 All-Round, P220, P226, P228, P229, P227, and others. 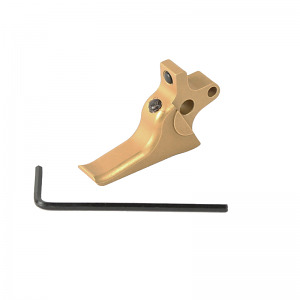 This trigger is not recommended for use in pistols with the DAK, double action only system. Will not fit SIG Pro, P225, P6, P239 and most SAO models. Also will not fit older P220 with 8mm wide trigger. Bore-Store Rifle Cleaning Mat 12" X 48"